We are a nation addicted to smartphones with 95% of the UK population having a mobile and an expectation we can use them anywhere we go. Mobi-Scan works with clients to implement the effective use of mobile scan technologies like QR codes, NFC Tags and Augmented Reality, to provide users with a range of links to useful online and text information. QR codes are the black and white square codes seen regularly on TV, posters and in magazines. By using QR codes, NFC Tags and AR, clients can build consumer brand loyalty, provide information and mobile offers and allow customers to make purchases directly on their smartphones. QR codes and NFC Tags link to website pages, mobile apps, text, pictures, audio, video, games, or any web link. Augmented Reality uses a mobile camera or GPS to offer the ability to scan a location or picture and provide a 'virtual view' over an image for items of interest or facilities at an event. Mobile scanning can link to mobile apps and map locations for mobile users at sports or live events. Together with mobile apps and GPS mapping, mobile scan points help users get the most out of their brand purchasing or visit to an event. The costs of mobile scanning technology is also relatively low and and you can make the most of content created e.g. using existing images to trigger AR links. Digital Past 2013 - Mobi-Scan speaks at Monmouth conference regarding smartphone scanning and apps plus practical demo session. 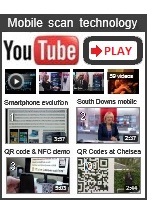 BBC interview on the South Downs - new mobile interpretation - QR codes, NFC and AR. Hampshire CC - QR code, NFC, AR & mobile app proposal for a cross-county heritage trail. AHI conference - Mobi-Scan shows QR code research results from the South Downs trial. Events partnership - Mobi-Scan teams up with O-Buds for mobile scanning and audio for brands, sport and entertainment events. Cornwall and Devon Councils - Mobi-Scan briefing about QR codes, NFC Tags and AR for mobiles for use on signs, map trails and gifts. NFC Technology Partnership - Mobi-Scan partner with RapidNFC to share NFC research. We would like mobile users to tell us about their experience of using mobile scanning. Please take part in our mobile questionnaire which should take no more than 5 minutes!